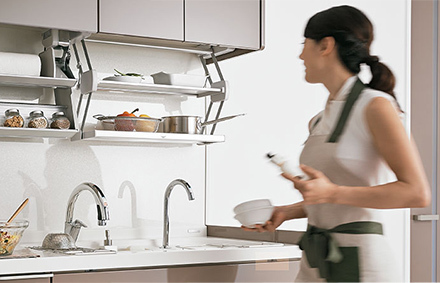 LIXIL Kitchen Technology (LKT) is the leading provider of system kitchens in Japan. We provide a full line up of products from small-space kitchen units to the most luxurious of residential kitchens, as well as commercial kitchens. 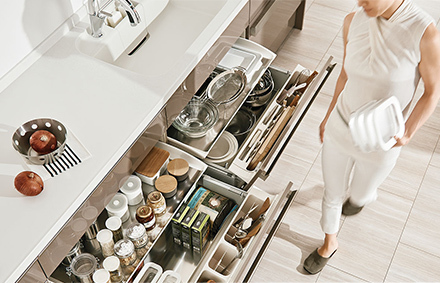 In China, we operate a joint venture with Haier, a leading home appliance manufacturer, and design, manufacture, and sell a full range of kitchen products. Over the years, the kitchen has experienced a fascinating evolution. Once a space for cooking that was isolated from other rooms, kitchens today are increasingly merged with living rooms and serve as a central hub for the home, with combined "living-dining-kitchen" areas where home occupants spend most of their time during the day. Pulling down the wall has allowed a wider living space, and the enhanced visibility has changed the requirements from mere functionality to also combine visual attractiveness, bringing a sense of pride to the home owner. The act of cooking requires a great deal of effort, attention and concentration, but it also inspires creativity and brings a sense of accomplishment. It involves sharing, while happy faces around the dining table bring joy and satisfaction. The living-dining-kitchen is now the "heart" of house where memorable moments take place, every day. 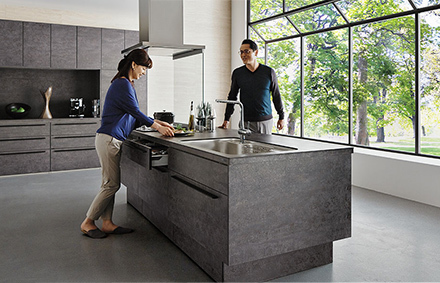 With kitchens increasingly central to the household and critical to people's lifestyles, at LKT we are committed to technological innovation to enhance functionality and design to contribute to your happiness at home. 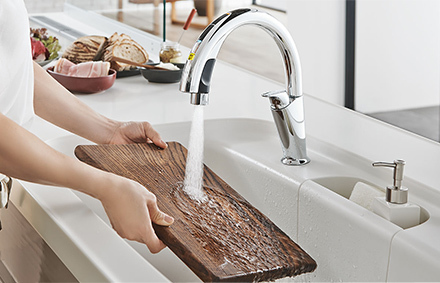 LIXIL Sunwave's legacy of innovation dates back to 1956, when it offered the first stainless steel sink in Japan's history. Later, in 1984 Sunwave brought to market Japan's first simple assembly kitchen, which significantly influenced the role of the kitchen in Japanese lifestyles. Today, continuing this pioneering spirit, we are committed to advancing technological innovation as well as pursuing better aesthetics and design by focusing on ease of cooking and cleaning, noise reduction and differentiated materials and design. The Richelle SI product range represents our passion by bringing both functionality and design to our customers and contributing to their happiness at home.